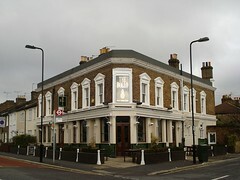 Gastropub in Chiswick, close to Chiswick Park Station. Food is served noon-10:30pm daily. Kake called in for a beer on a Tuesday early-evening in May 2008. The outside seating was all full, since the weather was great, and the inside was deserted apart from me and a couple of other drinkers. Most of the interior tables were set for diners, but there were a few small tables against one wall for drinkers. There's a piano, and sofas out the back. Service was distracted and a bit stand-offish, and they only had Greene King beers. Food looks interesting though photo of the menu as of May 2008. I might come back here to eat, but I wouldn't bother just for a drink; the Swan just up the road is much better for beer purposes. According to a sign seen in the ladies' in May 2008, quiz night is every Wednesday from 8pm, with champagne giveaways and a £100 first prize. Last visited by Kake, 13 May 2008. Opening hours and food times taken from Time Out website, April 2008. Last edited 2013-05-10 06:48:01 (version 9; diff). List all versions. Page last edited 2013-05-10 06:48:01 (version 9).